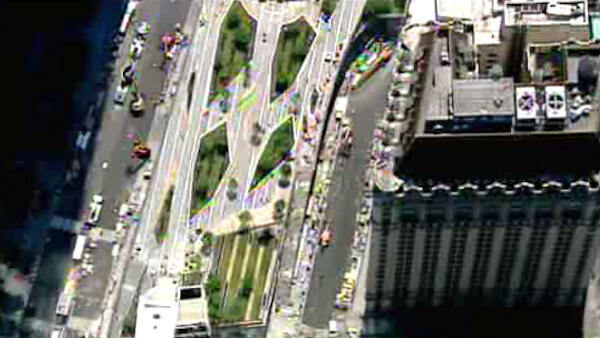 LOWER MANHATTAN (WABC) -- The World Trade Center's Liberty Park is set to open to the public Wednesday, but Eyewitness News got an early look at Lower Manhattan's newest and first elevated linear park above Liberty Street. The park, a smaller scale version of Manhattan's iconic High Line built on top of the World Trade Center Vehicle Security Center and surrounding the future St. Nicholas Greek Orthodox Church, will provide workers, residents and tourists a tranquil setting overlooking the National September 11 Memorial Plaza and One World Trade Center. The park has the capacity for 750 people and contains 19 planters filled with trees, shrubs and perennials. Last month, a sapling grown from the original Anne Frank horsechestnut tree that grew outside her Netherlands home was planted in the park. Ten additional saplings also have been planted in various locations around the country. One of the park's most striking features is a Living Wall, a creative vertical garden that runs along the north facing facade of Liberty Street, masking the driveways to the Vehicle Security Center. The wall, 336 feet long and 25 feet high, is built with a total of 826 panels that will be filled with 22,356 plants of six different varieties. In addition to the Living Wall, the park is a green roof and has several other sustainable features. They include reclaimed teakwood for the guardrails and benches, and LED lighting. The park will officially open at 11:45 a.m. on June 29.